Posted on January 14, 2015 at 9:18 am. 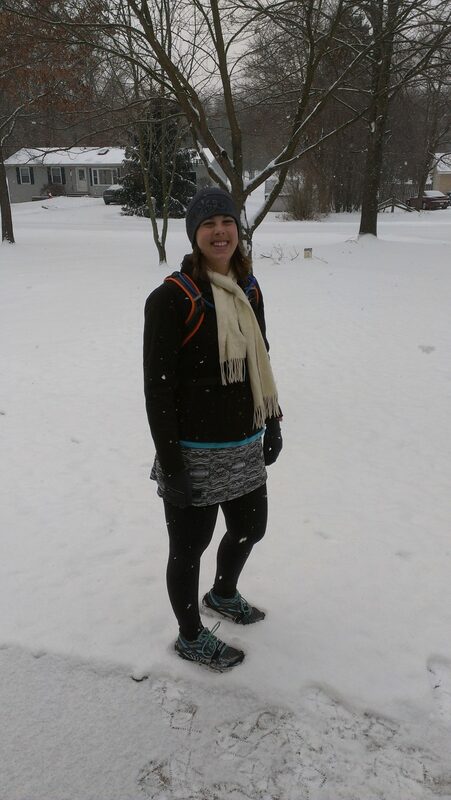 To call Kathy Sebright a dedicated distance runner is a bit of an understatement. Kathy, who lives with her husband Tony and their sons Travis, 6, and Emmett, 3, in the southwest Michigan community of Dorr, ran throughout her pregnancies, nursed one of her babies at the side of the road during a marathon, has directed a local 5K for several years, led “couch-to-5K” groups and paced fellow runners at numerous races. But what perhaps demonstrates her commitment to our sport and fellow runners best is an endeavor she took on in support of her son Emmett, who lives with Craniosynostosis, a birth defect in which one or more of the joints between the bones of a baby’s skull close prematurely, before the baby’s brain is fully formed. In 2012, Kathy ran 7 hours and 26 minutes on a treadmill in the hospital while surgeons “removed, broke apart, and put back together my 1-year-old’s skull.” More than 1,000 people virtually joined Kathy — through running, walking, biking, lifting — from 45 states and 13 countries. And in the two years since, on the June 20 anniversary of her son’s surgery, Kathy has again ran the full 7 hours and 26 minutes to raise awareness of Craniosynostosis. Kathy, running on the hospital treadmill. Kathy understands well how running has been a lifeline. 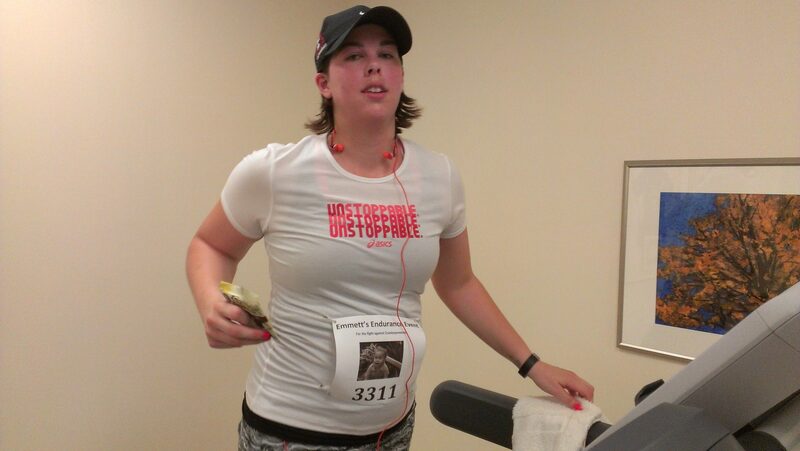 Kathy wants to help mothers of kids with special needs to feel empowered through running. I recently connected with Kathy to learn more about her incredible journey and how she is helping fellow runners in Michigan — and beyond. How and why did you start running? Ten years ago, I started running on a complete whim. I had gained about 10 extra pounds after I had gotten married and I wanted to lose it again. I figured running would be the fastest way to do that. I had never run before except the mandatory few laps in gym class back in high school. I didn’t know any better and figured two miles would be a good start. Clad in all cotton on a hot summer day and wearing old worn-out tennis shoes I used to mow the lawn in, I embarked on my first ever run. It was terrible and awful and by far, the hardest thing I had ever done at that point in my life but I loved it. I absolutely loved it. I somehow survived two miles but I wanted to go farther, faster, and more often. (I quickly wised up about training and not doing too much too soon). Running was freedom and power and just made me feel like me. It was in my blood, I just had to run. It wasn’t about losing weight anymore, it was just where I belonged. 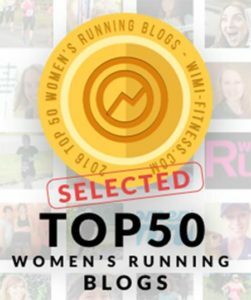 I progressed from 5Ks to marathons and ran through two pregnancies. I may have never run further than a marathon if it weren’t for my son Emmett, who inspired me to start to take on ultras these past few years. Please tell us about Heart Strides, and what it means for you to be an ambassador. Heart Strides is a charity that provides running shoes to mothers caring for a critically ill or special needs child. I first heard about Heart Strides on Facebook and both the cause and message resonated deeply with me. I connected with the founder of Heart Strides, Denise Dollar, and decided to become an ambassador. When your child is sick, many mothers feel extremely guilty about taking time for themselves. When there are hospital bills, medications, therapies, and more to pay for, a $100 pair of running shoes seems frivolous and unnecessary. Heart Strides encourages and empowers these overwhelmed and stressed out women to take charge of their physical and emotional health by giving them the gift of running. Running heals; I truly and honestly believe that. I have both seen it and lived it. By giving these women the tools that they need to succeed, I believe we can help change lives. Heart Strides has also just started collecting new or very gently used running gear to support these mothers even further. Being an ambassador means I can help make a difference in someone’s story, no matter how small. Whether I can encourage a new runner that is struggling, help fundraise so that we may send more shoes out, collect running gear, or just simply tell someone about Heart Strides, it all matters because you never really know what sort of affect your actions may have. Your favorite place to run in Michigan? There are so many amazing places to run, but I think my most favorite is an old and familiar trail. It’s a short trail within a campground near my house that runs through the woods and alongside a small lake. It’s beautiful and scenic and feels like home. I have run that trail over and over throughout the years, through all different seasons, scenarios, and through crisis after crisis. That trail has seen me fall apart time and time again, but it always welcomes me back. How about a running moment you’re especially proud of? That’s a tough one. I have two that carry nearly equal weight for me but if I had to pick one, I’d have to go with the biggest and baddest. Last year I ran my first 100-mile race. It was horribly disastrous and almost everything that could go wrong, actually did. There was extreme weather, torrential rain and wind, downed trees, a tornado siren went off, I got lost, I didn’t have my headlamp at night, I tripped and fell multiple times, I wore soaking wet shoes and socks for almost eight hours straight and my feet were just covered in blisters. It became painful just to have my feet in shoes, let alone attempt to run. I got sick, I hallucinated, and I cried and cried and then cried some more. Sheer exhaustion, pain, desperation, and frustration boiled over and took away all rational thought. I wanted to quit more badly then I’ve ever wanted to quit anything in my entire life. My husband – not a runner at all, not trained at all, and not dressed for it at all — knew I was in trouble and decided he’d run me in for the final 16-mile lap. 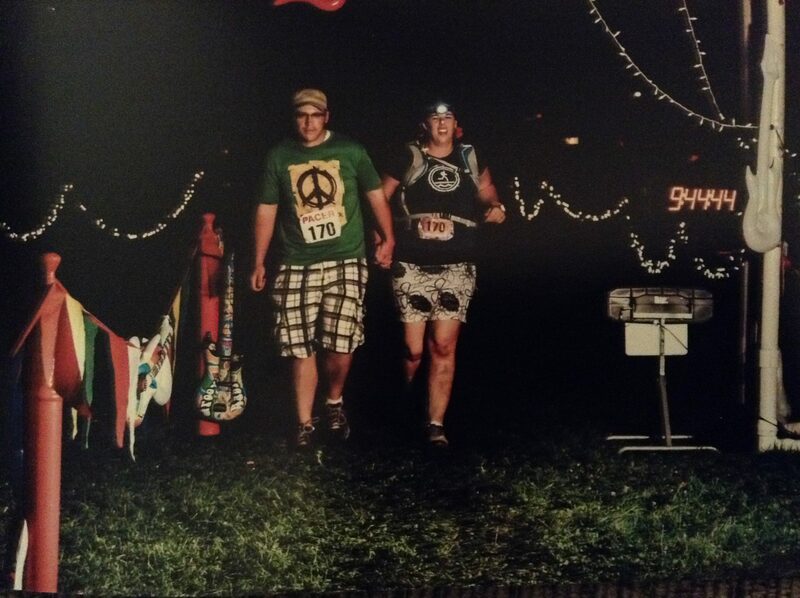 After 29 hours and 44 minutes, we crossed the finish line together: my husband walking while I shuffled slowly beside him trying to delude myself into thinking that I was actually still running as I tightly gripped his hand. It was the farthest either of us had ever run. Finishing 100 miles with her husband by her side. Please tell us about your son, his health journey, and how your running has been affected by this experience. It would be easy to gloss over this part and give you only the pre-approved highlights that paint the triumphant, if at times difficult, picture I want others to see but I just can’t bring myself to do it. Our story and our life is in the struggle. If I leave that out, I leave out everything. My youngest son Emmett was completely healthy (or so we had thought) until one day he just wasn’t. Days after his first birthday I found him unconscious and seizing wildly in his crib. That one seizure would change our entire life. Hospitals, medications, scans, more seizures, tests, and impending surgeries invaded our once peaceful life. Words I couldn’t pronounce, more and more specialists, and diagnosis after diagnosis overwhelmed us. I stopped sleeping. I stopped eating. I stopped laughing. I stopped working. Basically, I stopped living. My entire life was taken over by uncontrollable fear for my son’s life and how I couldn’t do anything about it. I was helpless in his suffering. For the first time since I had started running all those years ago, I didn’t want to run anymore. I didn’t care about it, I didn’t enjoy it, and it didn’t make me feel any better. However, I continued running purely out of obligation because I was pacing for the Fifth Third River Bank Run for the first time that year. One day, I went for a run, feeling particularly tortured because we had just set the day for Emmett’s first very major surgery. As I ran, I could feel the poison just below the surface. I ran harder and harder and pushed myself to go faster until it threatened to spill over and then I couldn’t stop it. I was crying, screaming in anguish, and dropping to my knees in the dirt. It was a breakthrough, letting some of that pain, fear, and heartbreak go. I got back up and kept running, stopping to scream and cry whenever I felt like it. And when I returned home, I felt a little bit better. Each day after that, running took on another meaning for me, the deepest most profound purpose it had ever had in my life. Running was healing me, along with my faith. It transformed me from an anxious insomniac and a fearful mom to someone brave and someone strong who believed she could handle this. When Emmett was 15 months old, he went in for his first surgery to correct the (previously undiagnosed) birth defect of the skull called Craniosynostosis. Surgeons had to break apart his entire skull, remove it, and then put it back together correctly with plates and screws to give his brain enough room to grow. To say I was scared is an injustice. It was so much more than that. There aren’t words for what it feels like to fear for your child’s life. You can try to imagine it, but it’s always worse than that. I couldn’t just sit in a waiting room to hear whether my son had lived or died or had a seizure in the OR table, so I decided to run the entire time he was in surgery on a treadmill in the hospital. 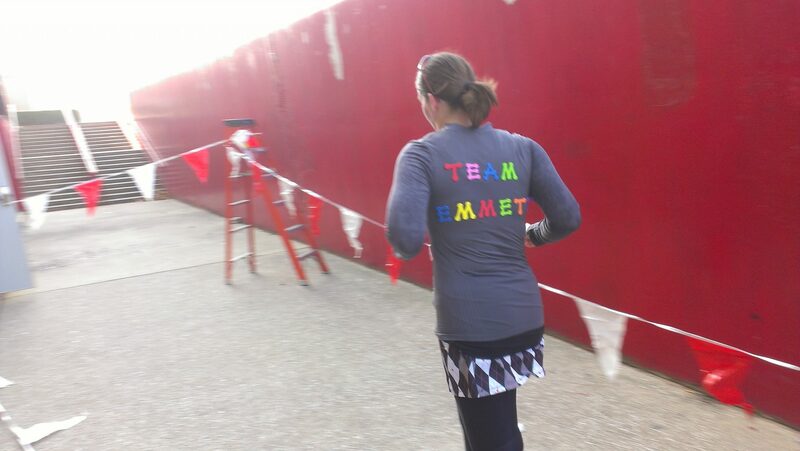 I made an event on Facebook and called it Emmett’s Endurance Event and over 1,000 people from all over the country virtually joined me. It didn’t matter to me how long it would take, if he was going to suffer, then so was I. There wasn’t anything I wouldn’t do for him. That 7 hour and 26 minute treadmill run was the spark that led me to ultras. In the terrible and exhaustive daze of running for hours longer than I felt I could, I found myself again. For the last two years, on June 20 the anniversary of the surgery, I run again for exactly 7 hours and 26 minutes. I do it to raise awareness for Craniosynostosis, I do it for Emmett, and I do it for myself. I’d like to say after that after surgery things progressively went onwards and upwards for all of us but they didn’t. 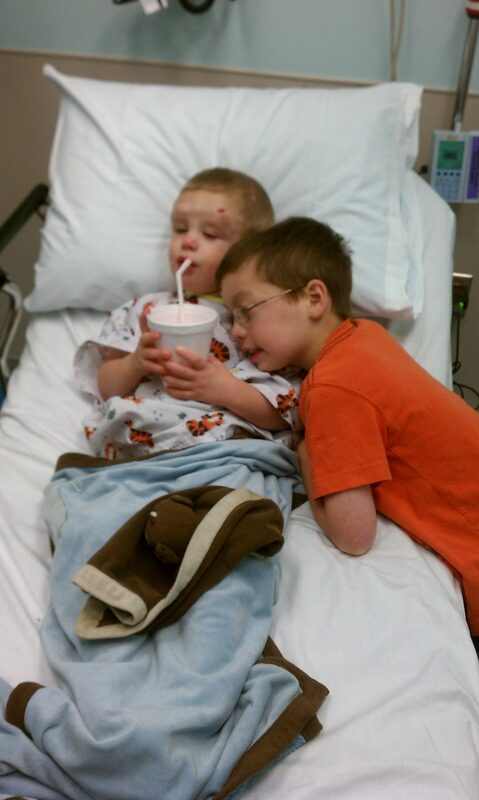 Emmett didn’t just get better after surgery. There were still seizures, another diagnosis, the brain lesion, more scans and tests, months of sleepless nights, and so much pain he was beating his head up against a wall for relief. I didn’t travel a linear line to healing my broken heart either. I fell apart, gathered myself back up, lost pieces of myself, found what mattered, and lost it all again over and over. It was a never ending roller coaster of extreme highs and the lowest of lows. Emmett went on to have four additional surgeries. His fourth surgery was just three weeks after my 100 mile race and that was the biggest catalyst in me completing that run. If he could suffer, so could I. I ran it with him in mind. He was the reason I couldn’t quit. His fifth surgery was just a few weeks ago and he is still recovering as I write this. And still, his strength inspires me to both do more and be more. Emmett and his brother Travis. Absolutely everything about me and my entire life has been affected by my son’s diagnosis. It has changed who I am to the very core. It has given me perspective and hope even amongst the darkness and desperation. I am stronger because of Emmett and braver because of Emmett. Running has given me an outlet, a way to face the deepest fears of my heart head on and keep going. Still today, I have no idea what the future holds for our son and I don’t know if I’ll ever be done changing as long as I watch my son suffer. I’m constantly evolving out on the open road and I’m so thankful I have that place that I can run to. Way to go Kathy Sebright you are truly and inspiration to us all. Praying for Emmett and all of your wonderful family!